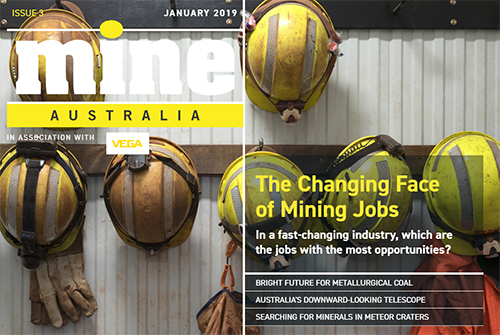 MINE Magazine is the essential reading material for decision-makers in the mining industry, bringing you the latest news and analysis in an exciting, interactive format. Produced by a team of experienced editors and contributors, this monthly magazine offers insights into key market and commodity trends, in-depth analysis of resources and prospects around the world and licensing and policy decisions affecting the industry, as well as updates on the latest technologies in exploration and operations, health and safety and environmental issues. MINE is free to read on all devices including mobile and iPad. You can read the latest issue here or browse the archive for back issues. Subscribe to MINE and never miss an issue. In this issue: Is it better to build or buy a mine in the future, De Beers’ end-to-end diamond blockchain programme, Newfoundland and Labrador’s plan to grow its mining sector, giving miners across the world a voice, and more. 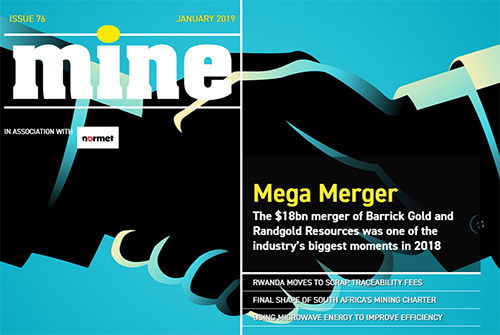 In this issue: The final shape of South Africa’s mining charter, scrapping traceability fees in Rwanda, the Barrick-Randgold mega merger, the problem with developing uranium projects, using microwave energy in mineral extraction, and more. In this issue: We round up the biggest and best stories from across the sector in 2018, take a closer look at employment opportunities in Australia, find out how companies are making the most of the lithium boom, and more. 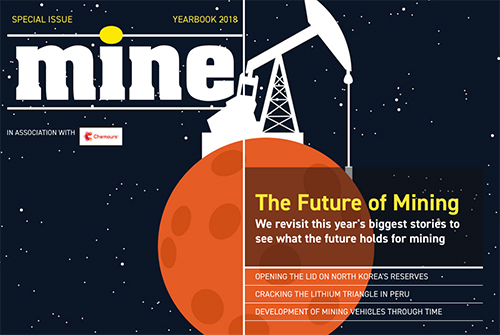 In this issue: We look back on the mining industry in 2018, including shake ups in North Korea and Zimbabwe, the biggest stories in tech and commodities, environmental issues such as Canada’s sustainable initiative, and more. 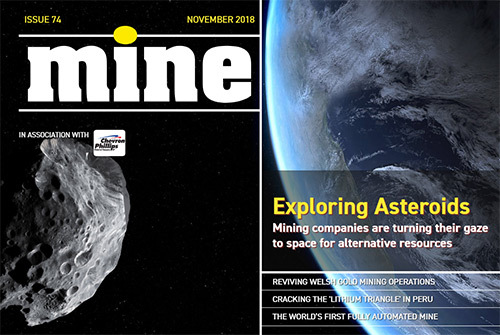 In this issue: Reviving gold mining in Wales, opening up the lithium triangle in South America, using big data to find minerals, a look inside the world’s first fully automated mine, the possibility of mining asteroids, and more. 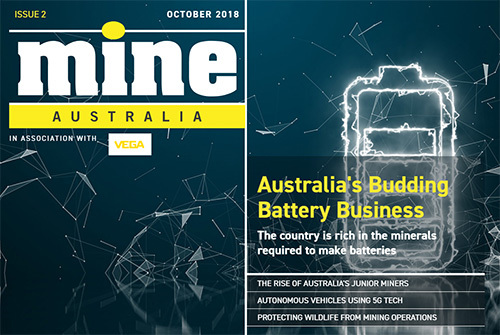 In this issue: Junior mining companies leading the charge in Australia, Volvo’s plans to use 5G mobile technology in autonomous operations, how miners can protect wildlife, the problem of recruiting staff to operations, and more. 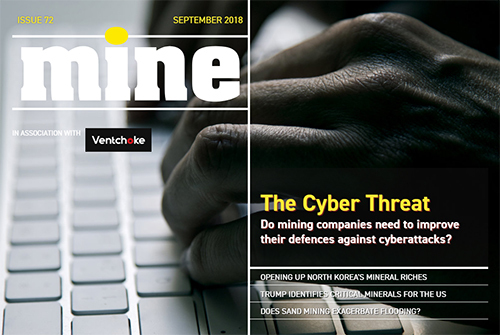 In this issue: Preparing mining companies for cyberattacks, a pilot using 5G mobile technology for industrial applications, opening up North Korea’s mineral resources, critical minerals in the US, and more. In this issue: Inside the Resources 2030 Taskforce, Western Australia’s lithium hoard, sustainable projects, changing work environments, autonomous drilling, drones, blockchain, and more. In this issue: China’s copper imports ban, Peru’s new president, the allure of Welsh gold, after Samarco, South African mine rehabilitation, lithium leaching, autonomous drilling, and more. In this issue: Commodities of the future, China’s monopoly on cobalt, rebooting Cuba’s industry, stamping out self-bonding, BHP’s world coal association exit, predicting earthquakes, and more. In this issue: Underwater waste forms new deposits, tech dumps of secondary materials, evolution of mining machines, Canada’s sustainability, overhauling the DRC’s mining code, and more. In this issue: Mining’s footprint in the Amazon, Mexico’s recovery, underwater robots for flooded deposits, digital risk and cybersecurity, training for automation, reinventing waste, and more. In this issue: Tapping the Grand Canyon, Chinese firms in Africa, the UK’s mining map, embracing the Internet of Things, optimising mine design, rhodium rides high, and more. In this issue: Mining moon minerals, a Canadian supercluster, rising exploration expenditures, AI and drones for operational excellence, vanadium’s time to shine, and more. In this issue:The biggest news stories, major projects, top performing commodities, breakthrough technologies of the year, the outlook for 2018, and more. In this issue:The race to mine Afghanistan, Yukon infrastructure, streamlining Australia’s legislation, artisanal mining in South Africa, AI for exploration, locating buried deposits, and more. In this issue:Cyanide makes for clean gold, Grasberg mine’s struggles, China’s environmental tax, Cornish lithium, titanium in Greenland, cobalt batteries, and more. In this issue:State-financed mines, Trump’s “amazing results” for miners, land rights in New Zealand, Industry 4.0, long-distance remote mining, Portland stone goes underground, and more. In this issue: Boosting black ownership, corruption in Uganda, seafloor mining, automated drill rigs, real-time ore analysis, mine rescue response procedures, and more. In this issue: Mining under Macron, Australia’s Iron Road, legitimising mica in India, De Beers to go carbon neutral, ICMM talks falling fatalities, the shrinking talent pool, and more. In this issue: China strikes gold record, the US coal comeback, mining in Mali, new mineral formations, a case for sand mining, the International Collegiate Mining Competition, and more. In this issue: Industry titans search for new leaders, Mongolia expands exploration, Australia’s iron ore tax, prospects for palladium, genomics and mine waste, award-winning hoisting, and more. In this issue: The amber industry trapped in tragedy, a $1m competition to disrupt mining, lithium in Cornwall, forgotten minerals, using drones for site surveys, the evolution of mining apps, and more. In this issue: Obama’s parting shot at coal, the Canadian Mining Hall of Fame, inching towards automation, Indonesia’s new regulations, ICMM’s water management commitments, profiling cobalt, and more. In this issue: The mission to mine on Mars, a war on man-made diamonds, illegal mining in Pakistan, managing microbes at sites, new end-of-life technologies, analysing market risks, and more. In this issue: Canada’s foreign human rights record, prospecting in Ecuador, finding new minerals, neutralising mine acid waste, tracing Australia’s METS sector journey, airborne medics in Africa, and more. In this issue: Raising capital in 2017, Iran’s market post-sanctions, the growth of Canadian junior miners, supporting the UN’s Sustainable Development Goals, CAT after Oberhelman’s departure, GE’s digital mine, and more . In this issue: The Philippines shutting down mining, Namibia’s growth, tin excavation in the DRC, MIT’s smelting discovery, Hexagon increases driver safety, inside the first Hackathon event, and more. 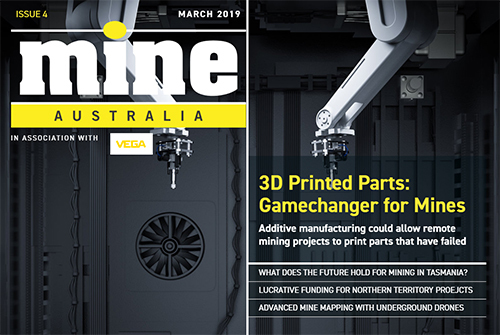 In this issue: Accelerating mining tech in Russia and innovation in Australia, setting a standard for artisanal mining, the potential for a global copper shortage, a new outlook for chemical extraction techniques, the Evolution of mine scheduling software, and more. 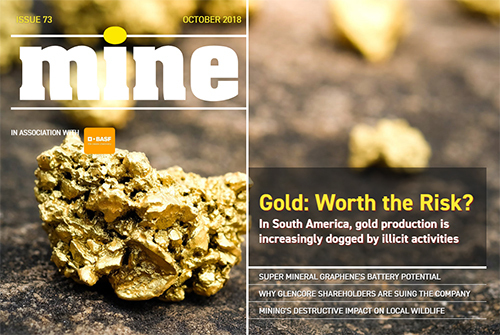 In this issue: The future of the underground mining equipment sector, Wealth Minerals talks about its strategy, a look inside Peru’s Fairtrade-certified gold mine, reviving Egypt’s ancient gold mines, the next step in UK seafloor mining, managing wastewater and more. In this issue: Sierra Leone’s new diamond project, the human cost of illegal gold, the MSHA push to reach zero harm, Anglo American’s safety culture, industry-wide changes in Kenyan mining, sifting through Sweden’s remaining minerals, Australia’s boost from scandium, and more. In this issue: Goldcorp’s massive data hack, rare earth minerals in Greenland, inside the world’s biggest copper mine, Rio Tinto’s driverless problems, Anglo American’s hold on De Beers, the latest in mining simulation technologies, and more. In this issue: How augmented reality is changing mining practices, tackling corruption in India with technology, turning Zambia’s copper into a goldmine, re-emergence of black lung, Carmichael coal mine, future supplies of phosphorus, and more. In this issue: Integra Gold’s crowdsourced gold rush challenge and the commodity’s performance in the market, a record-breaking mine blast, locating raw mineral resources across Europe, setting standards of safety in Russia and fair trade globally, and more. In this issue: Balancing responsible nickel mining with Madagascar’s delicate environment, a new way to discover copper deposits, mining in the world’s most adverse conditions, airborne electromagnetic surveys, British Columbia’s land access laws, enforcing EPA rules and more. In this issue: Oyu Tolgoi’s struggle to reach production, Rio Tinto’s driverless sites, excavating conflict mineral tantalum, the collapse of Arch Coal, thermal fragmentation to refine ore yields, mentoring for female workers and innovators, and more. In this issue: Transforming Myanmar’s jade mining industry, debating a global moratorium on coal projects and its future as a relic of the past, Tesla’s struggle to source lithium, the latest developments in mine waste storage, Boart Longyear’s drilling system, and more. In this issue: Unlocking India’s resource potential, South Africa’s landmark silicosis trial, an outlook for alumina, potash mining in the UK, Canada’s mining strategy under Prime Minster Trudeau, the legacy of the Jameson Cell and more. In this issue: The rise and fall of Glencore Xstrata, cleaning up New Mexico’s abandoned mines, trouble for platinum mining in South Africa, a look inside Canada’s mining innovation hub, removing cyanide from processing and more. In this issue: unlocking new sources of rare earth elements, the changing tides of tin, developing a strategy for deep-sea mining, how mining companies diversify as commodity prices drop, training the next generation of engineers, and more. In this issue: EU tackles the trade in conflict minerals, Australia’s iron ore tactics, China and the ‘rare earths crisis’, Amur Mineral’s Russian feat, seabed mining controversy, and more. In this issue: Boosting mining in Europe, Australia’s varying policies on uranium mining, improving gender diversity, conflict in Peru, mountaintop removal coal mining, and more. 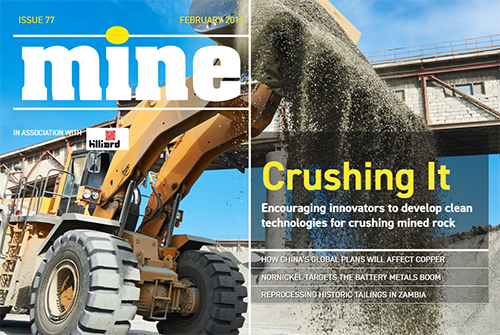 In this issue:The growing market for bulk material handling products and technologies, nickel-containing car batteries to the rescue, Japan and Australia’s economic partnership agreement, mothballing mines, and more. In this issue: Sized for success in today’s market, heavyweights return looking for new deals, the rise and fall of iron ore, South Australia catches up, Indonesia turns former mine into botanical garden, and more. In this issue: In this issue: Electric vehicles draw increased interest, turning methane gas into electricity in South Africa, corporate social responsibility in Canada, increased M&A activity expected in Australia, and more. In this issue: The price of gold mining in South America, Haiti’s resource potential, a positive outlook for zinc, autonomous drilling with Sandvik, resource nationalism on the map, Spain’s controversial Los Frailes mine reopening, and more. In this issue: Unlocking the potential of Canada’s Ring of Fire, new prospects for tin mining in the UK, the risks and rewards of space exploration, tackling false environmental reporting in the US, Bentley’s new MineCycle software applications, a recruitment outlook for the year, and more. In this issue:Incentives for explorers in Canada’s Northwest Territories, Afghanistan’s mining future, new power automation software from ABB, Glencore’s ambitious investment strategy, the frac sand mining boom and more. In this issue: Assessing the top mining business risks, Goldcorp’s journey from lows to highs, Kazakhstan’s promising mining future, the potential of geosynthetics for mining operations, innovative mine restoration projects around the world and more. In this issue: a positive outlook for gold, when emerging markets have emerged, the future of the DRC as a mining destination, a unique approach to mine pollution in Chile, Saudi Arabia’s move into mining, the iron sand controversy in New Zealand continues, and more. 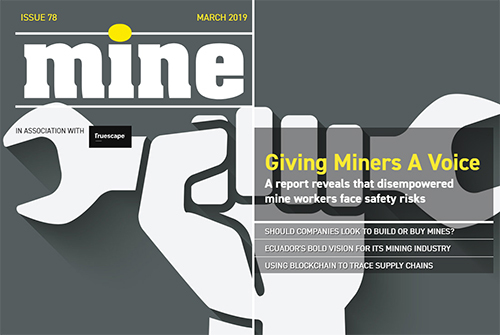 In this issue: Bolivia’s rocky road to reform, the rise of palladium, a new era of automated underground mining, London’s leading position in mining finance, innovation in mobile mining apps, the impact of gold mining in Peru and more. In this issue: The uncertain future of silver, Sierra Leone’s industry beyond the infamous diamonds, lessons learned from the Soma mine disaster, innovations in underground communications, metal-mining plants and more. In this issue: Chile’s challenged copper industry, ex-Xstrata CEO Mick Davis bounces back with X2 Resources, Canada’s efforts to attract new workers to underground jobs, California’s ban on suction dredge mining and more. In this issue: Indonesia’s export gamble, Canada’s push into the rare earth metals market, LNG-fuelled engines for mining trucks, holistic conveyor belt monitoring, increasing yields from complex ores and more. In this issue: Greenland’s mining future, innovation in exploration and drilling technology, Scotland’s controversial new mine project, extracting uranium from wastewater, global recruitment trends, and more. In this issue: Corporate social responsibility in junior mining companies, the market for barite, drilling innovation for Australia, the benefits of geographic information systems, the controversy of mountaintop removal mining in Central Appalachia, and more. In this issue: How new underground technology is helping companies maximise efficiency, the potential treasures hidden in small fault lines, how predictable maintenance can reduce downtime of critical equipment, what the industry is doing to make water management more sustainable, new insights about post-mining restoration in the Amazon, and more. In this issue: Which changes are needed to turn Africa’s commodity wealth into economic growth, the future of uranium mining in Western Australia, new technologies to make mining more environmentally friendly, the world’s largest haul truck, women in the mining industry talk about progress in closing the gender gap, and more. In this issue: Data management tools for mining operations, M&A trends in 2013, the challenges emerging from Latin America’s mining boom, a new licensing regime for seabed mining, and more. 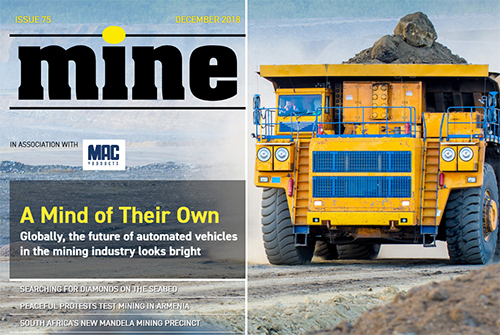 In this issue: Automated technologies for materials handling, the race for resources in outer space, why demand is rising for mine security, how a lack of regulation could affect the silica sand mining boom in the US, the challenges of assessing environmental impact of mining operations in fragile ecosystems, and more. In this issue: Reducing the impact of mining on the environment and local communities, specialist drilling in remote locations, risks faced by producers operating in South Africa, gender equality in the mining industry, and more. 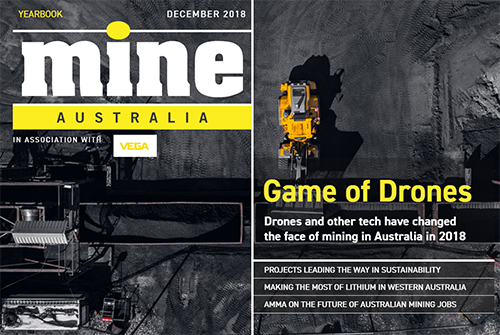 In this issue: Mine-mapping in challenging terrain with unmanned aerial vehicles, the mining industry’s digital revolution, cloud computing solutions, the dangerous work of Mongolian gold miners, mine project updates, and more. In this issue: The most advanced sampling tools | Mineral-munching microbes mine metals | Opening up Latin America | Why good management practices are key to safety | Australia’s top copper deals and projects | Global recruitment trends…and more! In this issue: The world’s most exciting untapped deposits, new technologies for extracting coal, Planetary Resources’ ambitious quest to mine asteroids, and much more. In this issue: The industry’s best safety technology, a world-first mobile gas lab, post-accident wireless communication, minerals of the future, soil restoration, and more. In this issue: The ultimate mining machinery, breakthroughs in autonomous systems, the vast resources of the BRICS countries and Mongolia, Australia’s skills shortage, and more. Reach your audience – delivered directly to 115,000 industry professionals inboxes and be seen by our online community of 137,000 visitors every month.